Experience gained from studies of the transient processes that accompany torsional vibrations, including an analytic solution of the problem along with results of calculations of transient processes, is generalized. 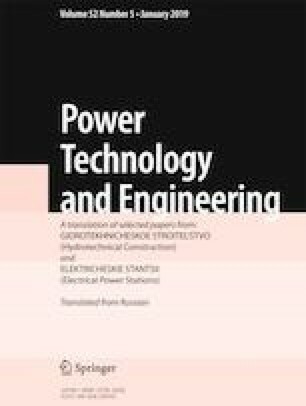 Features in the relationship between the driving torque of the turbine and the elastic moment on the shaft of the generating unit as a function of the point of application of jump in the load on the set are presented. Translated from Gidrotekhnicheskoe Stroitel’stvo, No. 8, August 2018, pp. 42 – 46.